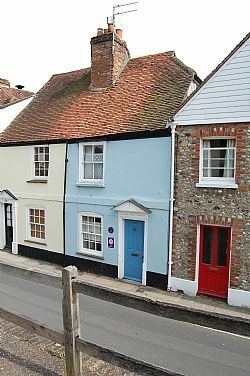 I have successfully run 2 holiday properties in West Sussex for 8 years. I love my work and enjoy seeing visitors return year after year. I always offer a personal touch - meeting and greeting guests, always being on the end of a phone and providing those personal touches like fresh flowers and a welcome pack with fresh milk and cake/biscuits. North walls cottage is one of the few remaining listed buildings in the City centre to have retained the character and charm of 17th century homes but with all modern facilities. I have resisted many offers to buy it as I enjoy renting it out for holiday lets for others to enjoy! 3 seater leather sofa, armchair, low tables, TV with Dvd & Freeview. Free wifi. Wood burner stove. Lovely new kitchen installed Feb 2018 with integrated dishwasher and fridge. Dining area seating 4. Fully equipped "home from home". Glass door onto small south facing walled patio. Notes on accommodation: A quaint but surprisingly spacious cottage. Newly refurbished and decorated externally and internally, thoughtfully furnished with all the things you need - home from home. Outside: Small south facing patio with bistro table and 2 chairs Cleaning / Towels / Linen / change over service included: All linen and towels included plus toiletries and welcome basket. We spent a delightful week staying in this charming cottage so near to the city centre yet tucked away in a quiet location. The cottage is very historic but at the same time it has every modern convenience without losing its unique character. Everything was immaculate, and we had a lovely 'Welcome' basket on arrival, plus essentials such as tea, coffee and milk, which we were especially grateful for as we arrived quite late. The owner was extremely friendly and helpful and was there to greet us. The location of the cottage is ideal for exploring the city and to use as a base to visit the many beautiful and interesting places in the surrounding area. Many thanks for a great venue which facilitated a lovely holiday. Lovely little cottage, with lots of character, close to shops. We enjoyed a lovely weekend shopping in Chichester. The cottage was close enough to drop off items, when the shopping became too heavy! We had a nice welcome basket, the beds were very comfy and the wood burning stove made the tiny lounge ultra cosy. Carol cottage is right in the center of Chipping Campden, but very quiet. The house is lovely and very comfortable and well equipped. We had all we needed and enjoyed our one week stay very much. Sorry my guest has just advised me he posted the wrong review so this doesn't apply to north walls cottage. Fantastic central location for Chichester . A very caring .considerate owner who made every effort to ensure that all was well and kindly left a welcome hamper -Thank you - will most certainly stay again! Beautiful coastline, beaches and natural harbour less than 4 miles away. Ideally located in a quiet one way street but right by all Chichester attractions like Theatre, Cathedral and lovely shops & restaurants. There is off street parking, free between 5.30pm and 9am or a 24 hour secure car park 5 minute walk away that is at its maximum fee £4.90 for 24 hours. Unfortunately because the cottage is so centrally located you have to use parking meters during shop opening hours.